Amazon KDP – to use the pre-order option or not? This is actually the second draft of a post I wrote three weeks ago, before the publication of my new book, Rise of the Wolf. I’ve had to completely change the post in the near-three weeks since Rise has been available as things didn’t quite go as I expected! My previous book, The Wolf and the Raven, which came out in April 2014, was available for readers to pre-order which was excellent as – at that point – indie authors weren’t able to do that. Amazon allowed me to do it because I was going to be publishing the novel while I was part of their team at the London Book Fair. On day one, The Wolf and the Raven hit number 1 in the WAR chart while Wolf’s Head reached number 2. It was fantastic to see, as you can imagine. So that was my prior experience of using the pre-order facility. It was exciting to see the book listed for people to buy before it was actually available, but when it came out and I thought about it, and spoke to a couple of other authors, it seemed to us like a pre-order might actually be counter-productive. The best promotion for your Kindle book is to get it as high in the charts as possible, right? Then the Amazon algorithms apparently start showing it to lots of readers, who in turn go and buy it, and it snowballs, we hope. 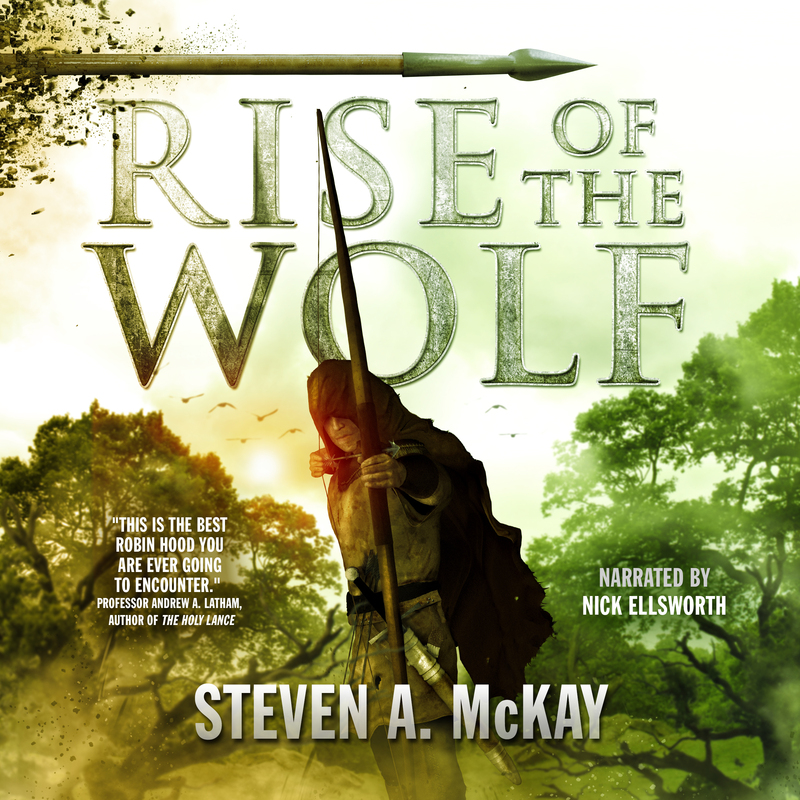 So, I thought it might perhaps be better to NOT do a pre-order for Rise of the Wolf, but instead to try and get as many people as possible to buy the book on the day it came out. THAT, I was sure, would fire it higher up the charts than sales coming in in dribs-and-drabs over a period of two weeks or whatever it might be before it was actually published. Well, my plan didn’t quite come together, despite lots of my readers doing their bit by buying and sharing the news on social media etc. You see, Amazon’s system, while being fantastic, doesn’t work instantly. When you hit the “publish” button on your book it doesn’t appear at that moment on Amazon, all nicely linked in to your paperback edition and your other books in the same series. All that takes a matter of hours or even days! Ditto your chart placing, and your author page and the various different international Amazon sites… The system takes a while to catch up and put it all together. In the end, although Rise of the Wolf has been sitting at number 1 in the “Historical biographical fiction” chart on Amazon UK for a few days now, it did NOT make that big, day one leap that I’d prayed for. What I failed to realise is that Amazon has changed since I published The Wolf and the Raven a year ago. Now indies can do pre-orders. Just take a look at the WAR chart, “Hot New Releases” section. See a pattern? That’s right, none of the books are out yet. They are ALL pre-orders. It’s a whole chart promoting books that aren’t even available. And people are buying them in huge numbers. When those books come out and are actually available to read they will have hundreds, thousands of people getting it straight to their Kindle and the reviews will start to flow in within a day or two. The paperback and ebook (or audio if it’s available – Rise of the Wolf is in production but won’t be ready until about September) editions will all link up, the series will show nice and neat on your author page and they are ALREADY in the charts so if you DO manage to get your most loyal readers to buy on day one you might just get that hoped-for spike that breaks the charts. We’re continually being told the publishing business is constantly changing but I hadn’t really seen much evidence of it myself until now. I made an error by not using the pre-order facility, an error which I won’t make again when I put out my next novella, The Christmas Devil, this December. I just hope the system doesn’t change again in the next couple of months wrecking my plans once more! I’d be very interested to hear from other KDP authors who’ve recently used the pre-order system. How did you find it? Any tips you can share with the rest of us on how to use it effectively? Please leave your thoughts as a comment or email me! Signed copies of Rise of the Wolf! I used the pre-order option for my new release, but I only had it available for about 10 days before the release date. I wasn’t sure what to expect and didn’t get thousands (or even hundreds) of orders, but I did get enough to get onto the Biographical Historical Fiction lists. This was a great statistic to be able to announce on release day! I did have some people ask why they couldn’t pre-order paperback, but such is life. To work with the fact that books don’t publish immediately, as you pointed out, I actually completed my book on CreateSpace & deactivated all of the selling channels. That way, when I activated them, it only took about 20 minutes to update on Amazon. I did exactly the same with my Createspace version Samantha. Hopefully they eventually make that available to pre-order too, so people can have it delivered on the same day the Kindle version comes out. “You face more competition on Tuesdays – Most major NY publishers release their books on Tuesdays. Because most big publishers are using preorders as part of their book launches (another reason you should too! ), this means you’re likely to face more competition on Tuesdays for the top spots in the bestseller charts. Saturday and Sunday are the biggest ebook buying days – Weekends are typically the biggest ebook-buying days at the retailers. If you time your preorder to release on a Saturday or Sunday, you’ll face less competition from traditional publishers, and you’ll chart higher on day when more readers are searching the bestseller lists for their weekend read. Sit-down holidays can be slow, but post-holidays are great – Avoiding major sit-down family-gathering holidays for release dates. For example, Thanksgiving and Christmas day, many readers will be occupied with family gatherings. However, the days after holidays are some of the biggest book-buying days of the year. December 26 through around January 7 is typically the year’s best ebook sales period based on our past experience. Keep in mind, however, that some ebook stores go into lock-down mode and don’t list new titles during certain holiday days. At Smashwords, we’ll usually start listing these blackout dates at Smashwords Site Updates around mid November so you can plan accordingly. Good stuff Sllingky, I hope your pre-order works out! Not sure I’ll be getting on the NY Times bestseller list either but, you never know, one day….